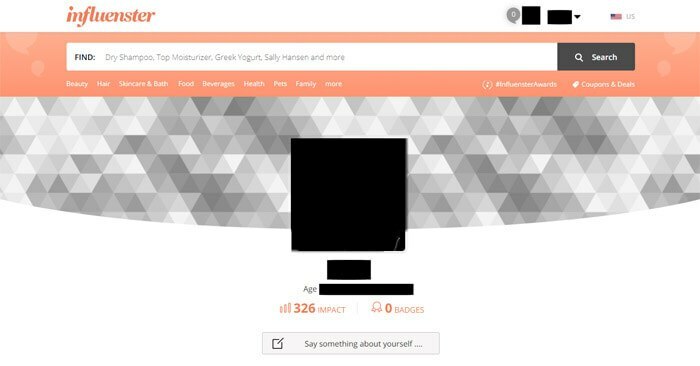 Can You Really Make Money With Influenster? I found this site online while looking for some ways to make extra cash, and honestly was surprised that I have never seen it before. From what I’ve heard, it pays you for discovering, reviewing, and sharing new products… but can you really make money with Influenster? To get started, I scrolled further down on the landing page to see if I could learn a bit more about it. In doing so, I saw all kinds of products and product categories offered on the landing page. There were health and wellness products, hair products, clothing products, makeup products, men’s products, beauty products, and many more. Upon reaching the bottom of this page, I found a link to an ‘About’ page, and decided to check that out, just to see if I could learn more about what I was looking at. So I did. And here is what I found. Here is what I learned on this page. So yeah. All in all, this seems quite simple. I also learned that the site boasts over 25 million honest product reviews, 4 million ‘socially active trendsetters,' and over 2 million products for users to discover. I continued to scroll down the site a bit, just to see what else I could learn. And there was a LOT of information to look through here… but I also found myself wondering exactly how this entire process worked. So next, I clicked on the Get Started button located at the top right hand corner of the screen. I wanted to figure out exactly how you used the site to earn rewards. Do they just send you random products? Do you order products and get paid for testing them? Do you get paid for reviewing and sharing the products? Or are the free products themselves considered the ‘reward'? There were a lot of things that I wasn’t sure about. So this seemed to be the next logical step. I chose to join the site using my Facebook login, which was super easy. I did need to verify my email address, but that also only took a minute. I was also asked if I was interested in receiving free products, which I said ‘yes’ to. It also asked if I was on Instagram, and wanted to connect my account. I do have an Instagram, but for now I just skipped this step. The next screen that I arrived at was this one. They asked me if I wanted to connect any of my other networks. Here was the full list. 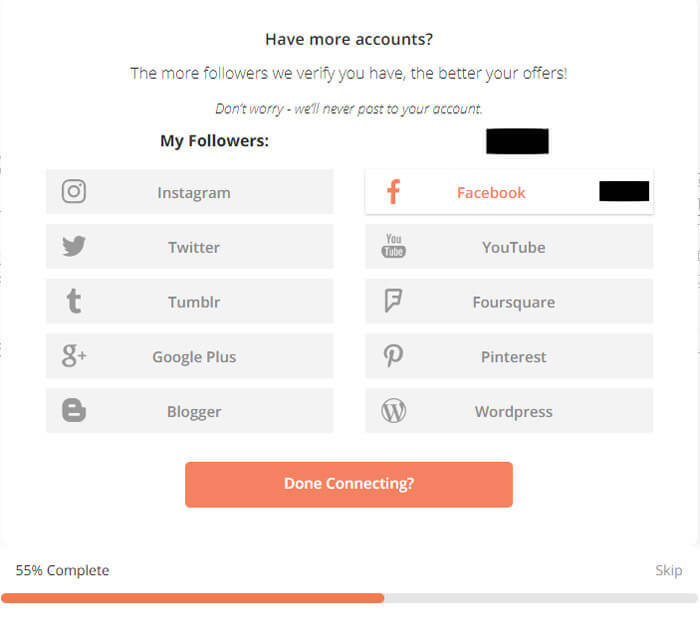 So here, you can see that you can connect a lot of social networks through Influenster, which is actually pretty awesome. I like that you can connect with so many of your friends and followers. But… then again… this is an app/website for influencers, and the site caters to people who have bigger social media followings for a reason. They seemingly want the products they send out to get screen time, which is why they do what they do (at least, that's what it looks like). So I can’t help but to imagine that having a larger social media following would likely be helpful if you ended up actually using the site. Next, we got to the main hub of the site. Here is what it looked like. Now, here I was actually starting to get things figured out. There were apparently a number of things that I needed to do yet to complete my profile, but I also found that I had some surveys waiting for me as well. So, determined to learn more, I did a bit more exploring within the main hub, to see what I could find. In deciding to take a closer look at the main hub, I scrolled down the page and found out that I had at least two tasks waiting for me. For one, I could complete my website registration. Or, secondly, I could take some ‘snap surveys’ as they were called. I was not super sure, but I thought that these surveys were demographic surveys (I actually ended up being wrong about this, but I talk about it more down below). Either way, I went back to the top of the page and decided to browse through some of the menu tab options next. I quickly realized that there were a TON of options. Every category that you hover over creates a drop-down menu with literally dozens of other sub-categories within it, and that was pretty awesome. But I wanted to see what I could actually find by going through these categories, so I selected one and clicked on it. I decided to go to beverages. And within this category, I chose ‘Energy Drinks.’ I drink quite a few energy drinks, and was interested in what I would find here. 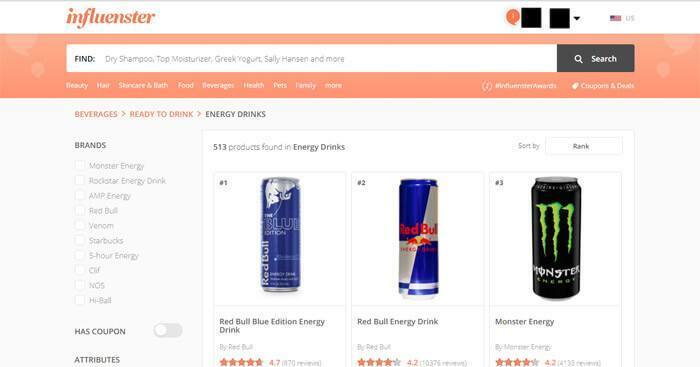 What came up was a page full of super-popular energy drink products (many of which I have tried before). Each of these had a number of varieties, a price, and a rating (1 to 5 stars). Each one also showed the number of times the product had been reviewed. There was also a picture of each product. Here is a screenshot to show you exactly what the listings looked like. I decided to click on the listing for Monster Energy, just to see what I could find. I’ve downed my definite fair share of this brand of energy drink, so I was interested in seeing where clicking on the different listings would lead me. This led me to a page where I could order a Monster from Walmart, leave a review for them on the page, or read reviews from other consumers, among other things. I wasn’t sure what leaving a review would get me, but I decided to do it. I wrote the review, which was quite easy. There was a nice text box, along with a little bar-guide that showed you how long it should be. It also gave you topic suggestions, which was pretty cool. I checked out some reviews of the site on other review sites, and learned some interesting things about it. First of all, I learned that you can get free stuff by using the site on a monthly basis, as long as you share what you get socially and do reviews and all of that. They also send out what they call a VoxBox to some lucky members every month. This box is full of products that the user gets for free, though I am not totally sure how you get on the list to be sent one of these boxes. I also figured out that the Snap surveys are not demographic surveys. These are actually part of a program called ‘Campaigns,’ and that this is another way to earn cool stuff on the site. Basically the more Snaps you complete, the higher the level you unlock—which also means that you will be able to complete better and better campaigns. And some of these campaigns pay you for doing things, like writing reviews or filming videos, etc. So that is another way to get rewards on Influenster. 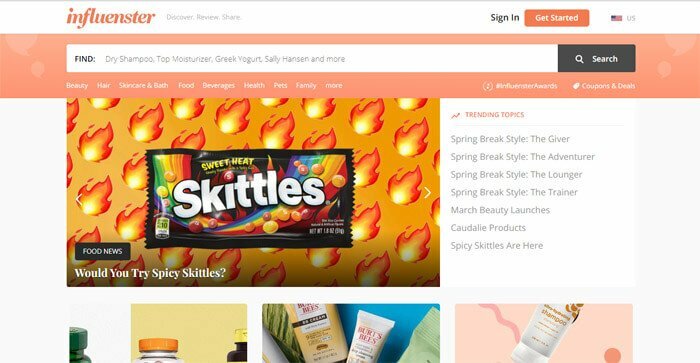 Influenster is an interesting website that can get you some free stuff and reward you for doing some social-media sharing on different products/ideas. But I would not rate it as an actual, legitimate side-hustle, mostly because you can’t make any serious cash with it. But this isn’t necessarily a critique of the site either. I did like a lot of things about Influenster, and I feel like it could be a really fun site to use for people who are interested in trying products and sharing about them online. If this sounds like something you might like to do, then this site may work very well for you. But, if you are trying to make some extra money and are looking into possible online side-hustles, Influenster probably wouldn’t make it onto your radar… mostly because it just doesn’t have a lot to offer in the ‘earn consistent, profitable cash’ department. If you enjoy answering questions, leaving reviews, and posting about new products, then you would likely find this site enjoyable and entertaining. But beyond that, it is not necessarily a ‘money making’ website.